One of the more surprising trends in the blues business the past couple of years has been the insurgence of small, high quality independent record labels. For most of the 1990s the best blues recordings were being issued by established companies like Alligator, Black Top, Bullseye Blues, Blind Pig and Delmark. While the latter two labels are still as strong as ever, Alligator and Bullseye seem to have slowed their pace of new releases, and Black Top has dropped off the map altogether. Quite frankly, I think that the best new stuff over the past two years has been issued by tiny newcomers like Cannonball, Severn, Mocombo and Fedora. Fedora Records has specialized in recording older and lesser-known artists, many of whom have not been recorded in a long time, if at all. These blues veterans are teamed up with a strong group of backing musicians and given the room to create their own sound. In every case, this formula has worked very well. The best of the latest trio of Fedora releases comes from long-time St. Louis guitarist Tommy Bankhead. Message To St. Louis is a very pleasant album, and shows the 69-year-old Bankhead to still be a strong, but not flashy, guitarist. The tight band is lead by excellent pianist Bob Lohr, who especially shines on the classic tune "Going To Chicago." Most of the songs on Message To St. Louis are Bankhead originals, with the best being the catchy numbers "It Ain't Right" and "Who Said It." 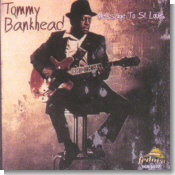 Bankhead's best guitar work is heard on the title cut, a mid-tempo shuffle, which also features nice sax playing from former Ike & Tina sideman Erskine Oglesby. Message To St. Louis is tough, urban blues at its best, and is highly recommended. Harmonica player/singer Arthur Williams is another St. Louis legend, and Ain't Goin' Down is his second release for Fedora. The Mississippi native is teamed up with another former Jelly Roll King member, drummer Sam Carr, in addition to many of the same backing musicians from the Bankhead disc. Williams is a strong harp player, best heard on his own "Go On Little Girl." He adapts his vocal style to the requirement of the song, sounding smoother on covers like "Poison Ivy" and "Since I Met You Baby," then going raw and raspy for the Howlin' Wolf-sounding original "Ain't Goin' Down." He then turns around and gets funkier on the Louisiana swamp sound of "Slop The Hogs." Ain't Goin' Down closes with Williams' version of the dirty dozens, as he raps away on the unexpurgated "Arthur's Dozens." I've always heard that St. Louis still had a strong blues scene. But after hearing these albums from Bankhead and Williams, I need to plan a trip there soon to hear the new St. Louis blues. Fedora moves to the West Coast for this third release, this one from the elusive Fillmore Slim. This man has recorded and appeared under many different names in the past. I have a very good vinyl LP released about 15 years ago by Clarence "Guitar" Sims, who I now know is one and the same as Fillmore Slim. Other Side Of The Road is raw, down-home electric blues, with eight of the 10 cuts being Sims originals. 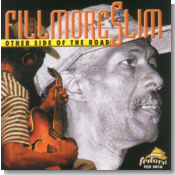 Fillmore Slim has a voice on the higher end of the register, similar to, but much rougher than that of Chicago singer Jimmy Johnson. One of my favorite numbers is the blues shuffle "Dial 911," which has a strong guitar instrumental very reminiscent of Guitar Shorty's sound. Sims' New Orleans roots (he was born and raised in the Crescent City) show on his version of "Blue Monday," a much funkier send-up featuring nice piano from fellow Fedora recording artist J.J. Malone and rock-solid bass from Jeff Henry. I've yet to hear anything I didn't like from Fedora Records, and all three of these CDs make a nice addition to any serious blues fan's collection.